Watching the Wits University women’s soccer team, you may spot a hijab-wearing soccer player at the centre back, defending the goals. Second-year BSc physiotherapy student Naeema Hussein chooses to play soccer in her hijab (headscarf) to represent her Islamic faith at a “higher level”. After matriculating in 2012, she was awarded a university entrance scholarship for her distinctions. Hussein was later awarded the Bidvest Wits Football Club bursary and has been playing for Wits for the past two years. 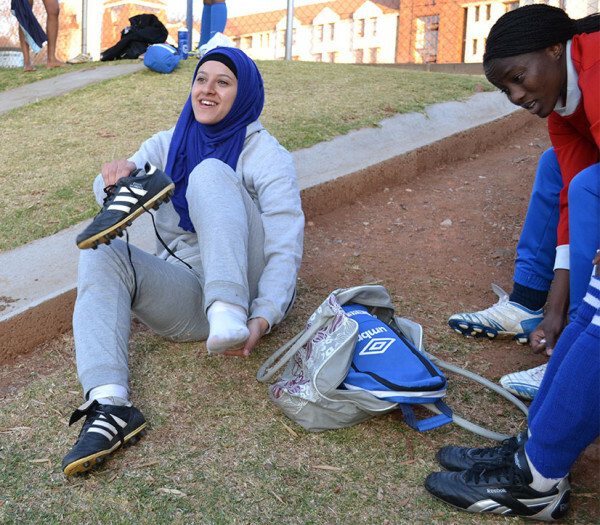 She takes credit for initiating playing with a hijab at Wits: “They were very open to it, very considerate.” The South African Football Association changed their regulations to allow Muslim women to play in a hijab. This also helped her cause. Hussein’s passion for soccer comes from her “Egyptian blood”. “I have three brothers … We’ve been soccer crazy ever since I was small,” she says. Hussein’s soccer career started in grade eight when she joined the Parktown Girls’ High School soccer team. “I was so excited. So I started on the second team, building myself up.” A year later, she was in the school’s first team and pushed for a ladies’ team at the Marks Park Football Club. In 2010 the team was one of the youngest invited to compete at the Arsenal International Soccer Festival in London. “I think we came back with experience that was priceless,” says Hussein. The exposure to higher levels of soccer pushed the team to perform at their best. Hussein was also the recipient of this year’s Golden Key New Member Chapter Award at Wits. It recognises academic excellence, leadership roles, commitment to community work and participation in extracurricular activities. Hussein is a member of the Wits Muslim Students’ Association and the Muslim Youth Movement. Last year she served on “the core” of the Palestinian Solidarity Committee. Additionally she is part of Awqaf South Africa. Awqaf is an Arabic word for assets donated or purchased for specific charitable causes that are socially beneficial. It focuses on youth and leadership development, immediate poverty relief and long-term community investments. Hussein and a group of girls under the Islamic Careline organisation two weeks ago launched a leadership development programme for young Muslim women between the ages of 18 and 25. Called Hayatoon-Nujoom, (“our star”) which they hope to expand to other demographics. Wits Vuvuzela. Women’s team refuses to whimper. August 16, 2013. Wits Vuvuzela. Ramadan: A time to reflect and fast. August 2, 2013.